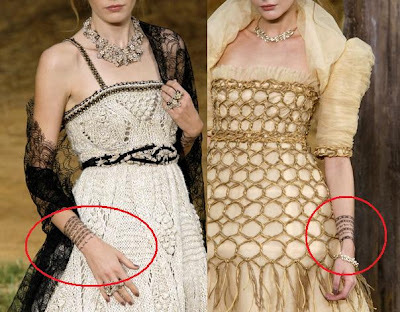 I got a notification to get on the waiting list for these temporary Chanel tattoos, as seen on Chanel Spring 2010 runway. Apparently, Chanel will release 25 exclusive iconic skin arts to loyal fans. There is no retail price available yet but I have heard the tentative price is $90 per set. I am curious to see the final retail price. I always wanted a cute little tattoo on my ankle but the big cowardly chick in me can't stomach the idea of pain. Also, will that same tattoo look odd when the same area wrinkle with age in the future? For moi, I love to add something temporary on my wrist for fun. It will satisfy my desire to have cute tattoo. No pain and all fun!!! I wouldn't mind buying some for fun if each set includes quite a few tattoos but somehow I don't think that will be the case. We shall see. 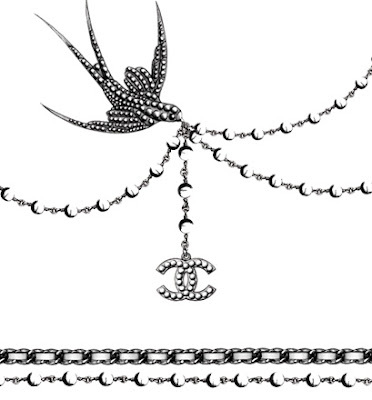 What do you think of Chanel temporary tattoos? I love the way they look (I'm actually thinking of getting my first permanent tattoo this year), but I'm afraid I can't stomach $90 for something that'll wash off in the shower. If you do buy these though, I'd love to see pics! I like the wrists designs pictured above, and even though I am all for the real tattoos (I have 5) and usually look down on the fake stuff, I think I'd like try those for fun. i think it depends on the temp tattoo - how long it lasts. when i was a kid those temp tattoos only lasted me a day. I bet this will end up being more of a collectors item than anything else. I can't imagine many grown women rubbing on an expensive temporary tattoo! I love the idea of these but couldn't justify the price! I'm really not feeling it. I think temporary tattoos are a good idea... once your OLD the tattoos won't be sagging like real tattoos! OMGD that is absofuckinglutely amazing!!! please update me if you heard anything about it coming out to market. Absolutely love these! Leave it to Lagerfeld to make tattoos chic! I love them but I am getting annoyed with Chanel on this limited release thing. It is turning me off the brand as it seems a good way to control stock takes and force people to buy rather than miss out. But you should get them and enjoy! I hope you receive them from the waiting list, can't wait to see them on you! Love the Chanel Tattoos! Thanks for the comment, both items in that photo are for sale in my shop! I love those so much !!! I reallly want them!! I can't wait until other, more inexpensive places start carrying their own versions. I will totally buy one! i heard about these.. they look totally awesome! I am the same as you and absolutely will not get a permanent tattoo. The Chanel temporary ones look interesting. That would be great if you could get your hands on one. i really wanna try it. i think it's cool. These are so fun...they'd be a great gift for someone. One of those things you wouldn't necessarily buy for yourself but if someone gave it to you, you'd be ecstatic! And why not buy them for an event anyway? An updo can cost that much and more. I'd rather have a wild temporary tattoo! Gosh that necklace is gorgeous! It looks like a live picture! Love them! Not on the thighs, but on the wrist or as a necklace they look great! I think the price is ridiculous for a set of stickers... and I don't think they're really durable. I agree with Brunch at Saks... in the right place they could be totally fantastic... I smell a firestorm of a trend brewing here. Soon we'll ALL be rockin' faux designer tats! My thoughts RE: real (permanent) tattoos are the same as yours - how will that look when I'm old and my skin isn't in such good condition? :) Oh well. At least the temporary tattoos allow you have some fun for a little while. I like these!! I've seen these around the blogosphere lately and I must say, even as a tattooed lady myself, these are super exciting and fun.